Sometime last year, I saw a friend of mine "like" a band on Facebook. I noted their name down, and had a look over their credentials which included being signed to EMI. Which now oddly seems somewhat more dubious than at the time. Anyway, that band was Norwich duo Octagon Court, who regardless of major label status, are worth keeping an eye on. Stephen Draycott and Charles Audsley are the men responsible for Octagon Court, purveyors of intriguingly off-kilter electro-pop. There's something overwhelmingly eighties about their sound - especially in the sweeping darkness of the superb 'Bring Her In'. 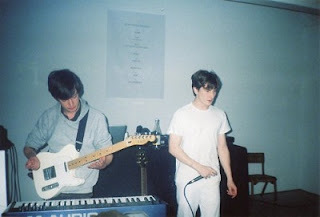 Yet many of the bands I think of in comparison to the duo are more contemporary - the slightly unconventional pop side of Field Music and their respective side projects to the darkened atmosphere of a band like O. Children, while the eloquent vocals are particularly reminiscent of Wild Beasts. Octagon Court's music also has an element of Talking Heads, who had an eye for theatrics, so perhaps it's not surprising that the duo are bringing a "special live narrative of dance & music performance" entitled 'Esthar', which ties into a music video launch for 'Bring Her In', to Dalston's Visions Video Bar. The video above gives some idea of what to expect - which seems at least a little out of ordinary. Much like the band themselves, who are perhaps the next step in the evolution of electronic music.